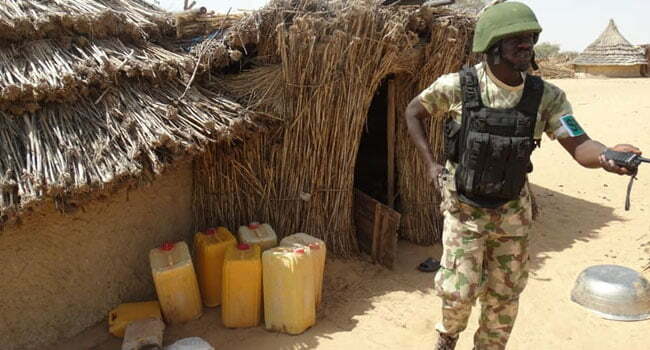 Operatives of the Multinational Joint Task Force (MNJTF) have killed five suspected Boko Haram insurgents in collaboration with soldiers deployed to Borno State. The MNJTF Chief of Military Public Information, Colonel Timothy Antigha, disclosed this in a statement on obtained by Naija News on Friday in N’Djamena, Chad. Oetv News understands that the soldiers also arrested three suspects while three other suspects surrendered to troops in Cameroon. “Troops of the MNJTF and national forces operating in Doro Naira and Ngolom environs made contact with Boko Haram terrorists and at the end of the engagement, five terrorists were killed, three captured, while others fled,” Colonel Antigha revealed. The spokesman re-emphasised the task force’s commitment and determination to deal with the violence orchestrated by Boko Haram insurgents in the Lake Cha. “Acting on intercepted Boko Haram communication, a coalition of MNJTF Air Forces conducted air interdictions in Madayi, Meri and Tchoukou-Bol and destroyed Boko Haram logistic equipment concealed in thickly forested areas,” he added.